Actions from Northowram v Copley United, at Northowram Rec. 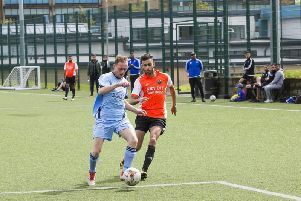 Hebden Royd Red Star, Mixenden United and Northowram won the three top flight matches to go ahead in the Haslem Sheppard Halifax AFL on Saturday. The previous day’s snow and rain meant only eight of the 18 scheduled fixtures took place, although Midgley Reserves were unable to raise a team to play away to Ryburn Reserves in Division One. A 2-1 derby defeat for Midgley’s firsts at home to derby rivals Hebden Royd Red Star completed a bad day for the club. Injury-hit Midgley had lost 3-1 at home to Greetland the previous week and the third-placed side’s title hopes now appear to be at an end. Craig Gee’s men played well for the opening 30 minutes and took the lead through their best player on the day, skipper Andrew Butterworth, after good work from Ryan Jeffreys down the right. Star, who won at Midgley last season, were soon on terms when Mark Bradbury picked up a loose ball and finished well. That lifted Star, who took the lead through Lewis Cockroft’s close-range header 10 minutes after the break. Good hold up play by Rob Stansfield enabled Marvin Bonney to make it 2-2 but Luke Chadwick was helping Star get the upper hand in midfield and his brother Will found space down the right and struck the winner with 15 minutes left. Mixenden got back to winning ways after a torrid few weeks with a 4-1 win at Greetland. Damian Randall was the star man as they stepped up a gear in the second half after it had been 1-1 at the break. Chris Woodhouse opened the scoring for the visitors with a shot from the edge of the box but Charlie Cliffe equalised after visiting ‘keeper Mick Griffin was dazzled by the sun and lost the ball. Woodhouse cut in from the left and scored with a powerful shot across the keeper while Mixenden’s other two goals in the second half came from Randall, who gave the home defence a torrid time. Northowram were 2-1 winners at home to Copley United in a key match near the bottom. The Rams just about deserved their victory, having taken a 2-0 lead down the slope in the first half. Josh Baines was narrowly wide with a firm shot and Chris Conroy and Danny King got in each other’s way as a good chance went begging. Conroy then rounded the keeper but shot across the face of goal. Copley had a penalty appeal turned down before young home fullback Sam Gee picked his spot and finished well after half an hour. Industrious veteran Chris Gent then found Conroy with a superb through ball and the front man made it 2-0 after 42 minutes. Copley were kept in check until the start of the final quarter when the ball went in off the post from Shane Dawson’s fine left-foot strike. The visitors might have grabbed a point but for Allen Slingsby’s one-handed late save. Sowerby United’s promotion and title hopes took a knock in Division One when they were beaten 3-1 away to derby rivals Sowerby Bridge. The Bridge went ahead after 10 minutes when Chris Doyle headed home a deep cross. This spurred United into action but several golden chances were spurned. They eventually levelled in the first minute of the second half when Rory Thickett scored with a good header from a cross. United were bossing things now but failed to convert more chances and paid the price when Ben Hydes forced the ball home after it came back off the bar from a Chris Punda free kick. Punda sealed victory for Bridge from the penalty spot with five minutes to go. Two goals from Martin Jenkins were in vain for Salem, who lost 4-2 away to fourth-placed Elland Allstars in the section’s only other game. Jorge Westin-Pearson, Stephen McNamara, Stephen Mitchell and Peter Noble were on target for the winners. St Columba’s put two defeats behind them and went nine points clear at the top of Division Two with a 3-1 victory at home against Northowram Reserves. Saints were handed the initiative straight from the kick off. Northowram gave the ball away to Jack Wilkinson and his through ball set up Frank Odion to prod home within the first 30 seconds. The hosts were well on top in the first half with Andy Sandells and Vinny O’Shea causing problems down the right. Man of match O’Shea grabbed the second after another raid. The game was killed off before half time when striker Odion scored a rare goal from outside the penalty area, having been teed up by Ryan O’Neill. Saints pushed for more goals in the second half but couldn’t find the back of the net and Northowram pulled one back with 20 minutes left through Ash Ackroyd. Greetland Reserves moved up to second with a 6-1 win away to Salem Reserves in spite of fielding five players aged 40 or over! Youngsters George Bainbridge and Ollie Hirst gave the visitors a deserved 2-0 lead before half time but Scott Fieldhouse scored just after the break to give the hosts a life line. Brian Vickers’ well placed header from a Daz Ward free kick restored the two goal advantage before substitute Luke Whitworth added another with a cool finish. Bainbridge scored his second after breaking clear of the defence and Darryl Camp rounded off the scoring after a good run down the right wing. Shelf United Reserves picked up only their second league win of the season but did so in style, by 6-1 away to Hebden Royd Red Star Reserves. Ross Broadley got two of the goals as they climbed off the bottom, above AFC Crossleys Reserves.